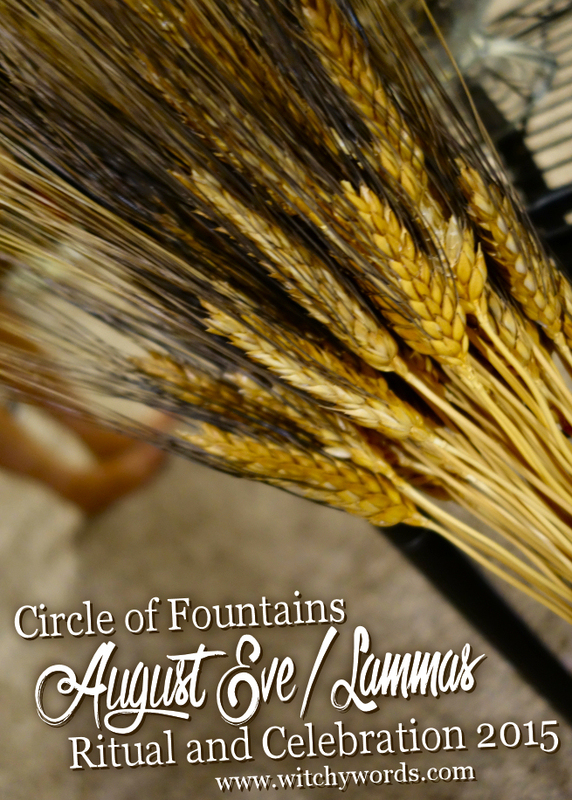 For Circle of Fountains 2014 August Eve Ritual, click here! My personal August Eve altar will be posted in the next few days! August Eve was planned, written and led by the wonderful Phaedra! Hosting at my house was a bit of a chore since we're in the middle of moving and my husband's health issues, but we somehow pulled it off with Tony's diligent cleaning and Phaedra showing up extremely early to help set up. Thank you both! Before ritual, I finally had the chance to give my circlemates something amazing! About two months ago, we finalized the Circle of Fountains symbol (you can see it in the corner of the picture above opposite the Witchy Words logo). The minute we finalized the symbol, I talked with someone online and had that person begin a very special project. Because they were coming from halfway around the world, I assumed I wouldn't receive them until before Samhain, but they came in early and I simply couldn't wait. So, for August Eve, I could finally unveil their surprise! 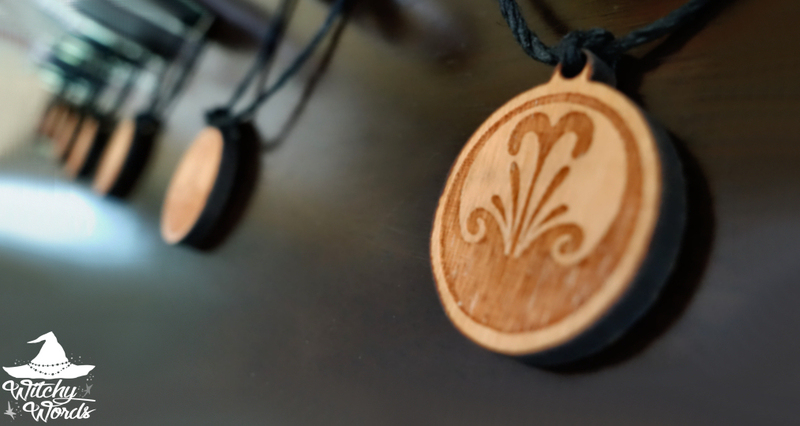 Circle of Fountains pendants! We have two levels of membership in the circle. Guest Members are members of the circle, but they don't lead any rituals, have any responsibilities and can pick and choose which rituals they RSVP to. Primary Members are the ones who do all the hard work. They keep the circle running, lead rituals, manage the money and more. So each Primary Member received their very own pendant that connects us as a whole circle. Everyone was so thrilled with them; squeals all around. 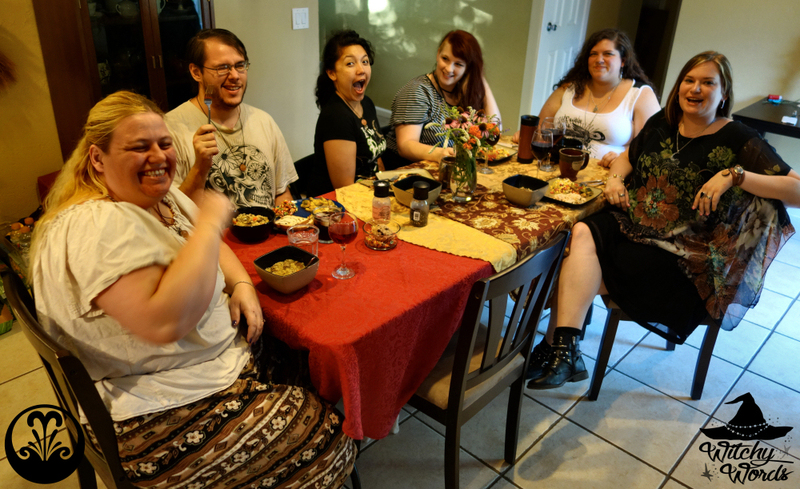 As with all celebrations, we began with a potluck. 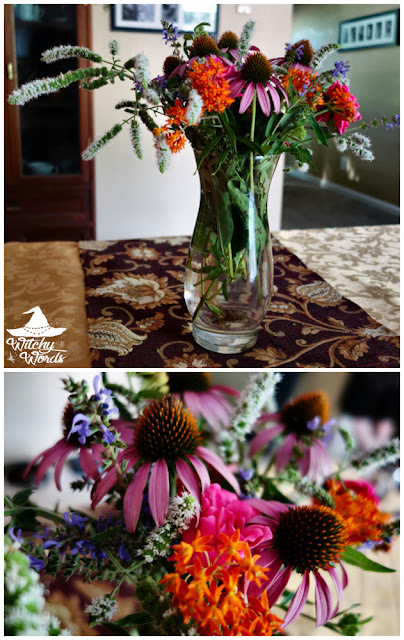 I set the table with red and gold with a collection of flowers from my butterfly garden in the center. I'm going to be so sad to leave these behind when we move! Our potluck consisted of both chicken and beef main dishes along with corn and squash based sides. The ratatouille was made by my husband who still made it even though he wasn't feeling well, so huge kudos to him. In addition to everything pictured, we also had chocolate chip and raisin swirl bread provided by Tony. Also, the blackberry wine was a homemade wine by Liithi Lushede High Priestess Gwenhwyfar Wyrdd. I don't know what she did to the wine, but it made us all positively giddy on just half a glass! Case and point, our group dinner photo. Wow. Once dinner was complete, we headed downstairs to my spiritual room! Phaedra began by introducing the holiday before we cast the circle. Each member of CF volunteered to call a quarter beginning with East. Once the circle was cast, the string lights were lit and we began our ritual! You'll notice that the taper used on the altar came from the recent Sabbat Box release for Lammas. That's because we now have two members of the circle actively receiving the box, one of which is Phaedra! End goal is for all members to be able to afford the box so we can use them every ritual. After we calmed down from some giddy giggling thanks to Gwenhwyfar's wine, Phaedra discussed the Harvest sabbats. Though Lammas is just the first, we must acknowledge the coming of the cold winter. August Eve is specifically a time of sacred sacrifice: of giving up bad habits, negative thoughts and toxic relationships. For ritual, Phaedra made a bread man. For some, the bread man represents the god of Harvest who sacrifices himself for an abundant bounty. For others, the bread man can be a metaphor of those things which we must give up in order to move forward. By breaking the bread man up, he was sacrificed during our ritual. Our bounty will be full! We then consumed some of him to bring abundance to us. 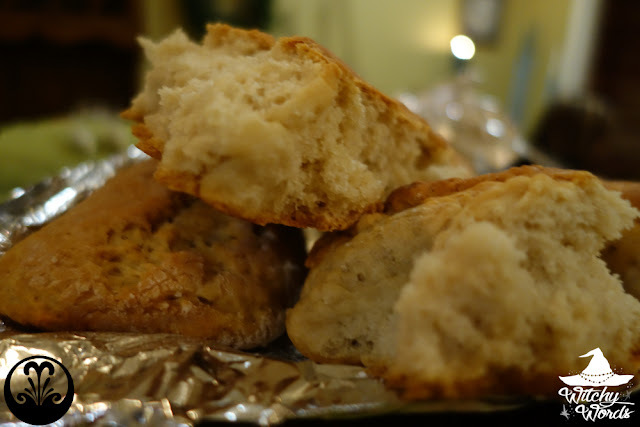 Since the bread was safe for all members to eat, I fed a tiny piece to my dog, Artemis, as well. What was left over was placed back onto the tin. Phaedra stated that, after ritual, you could take a piece of the bread man, fill it with any negativity within you and anything you need to sacrifice and then throw it out into a field to remove those energies from you. We then sat down to make corn dollies! Phaedra explained that corn dolls are meant to represent the abundance and work of the first harvest, and a way of saying thank you for the bounty. We utilized Sabbat Box's instructions on making a corn doll. Out of every year that I've made one, I was probably the most satisfied with this year's, so a huge thank you to Sabbat Box for that one! She even stands up on her own! Super proud! The final step in Phaedra's ritual was to create spell jars. We created Witch's Bottles filled with various intents last year but, this year, they were specifically for protection. This was particularly relevant as we have three members of the circle moving - myself and Tony of course, but also Kolika - and one member dealing with some struggles. We filled it with various herbs and items ranging from lavender to eggshells to coffee beans. Some members opted to put pieces of the bread man in it. Other members charged objects to place it in. We're becoming much more cohesive as a circle, so many of the members opted to have all of the other attendants place their energy in the jars in some form or another. For some, this meant having everyone charge a single object. For others, it meant having everyone draw a symbol or write their initials on the jar. My jar contained a ton of lavender, eggshells, fresh rosemary and coffee beans. I had everyone charge a protective quartz crystal and placed that in there as well. I also had everyone lick their thumbs and place their thumbprint on the portion of the lid that would be sealed under the band. It was a way of connecting them to the jar and having them seal it with their energy. I sealed it with lavender and dark green ribbon. I'll be taking it to our new home when we find it! With that, we closed the circle and completed ritual! Some of us had to leave but the rest of us stayed behind and chatted late into the night. I think we can all say we definitely needed this! And that concludes the Circle of Fountains August Eve ritual and celebration for 2015! From my circle to yours, have a fantastic Lammas! To see the previous sabbat, Midsummer / Litha, click here! Such a lovely post. It is nice to see a circle share in an open way. I am jealous that I do not have local friends and followers to share with. what a wonderful post! I'm so sorry about your house, but I know that when you find the next one you'll fill it with just as much love and light and magic and fun as you have in this one! I know how hard it is leaving a place you thought would be forever (or at least a long time), I really do.